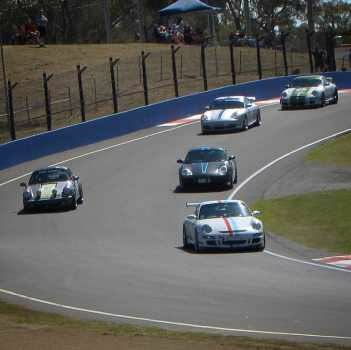 The Porsche Regularity event will again be held as part of the 2019 Bathurst 6hr Meeting, an event which will be held under the International Sporting Code of the FIA and the National Competition Rules of CAMS - CAMS Permit No. TBA. Entries will only be accepted with full payment and with all details on this registration accurately completed, including a valid state Porsche Club membership number. All payments MUST be made via Credit Card through the link below. NO Cash or Cheque payments are possible. Acceptance of Entries: Entries will only be accepted from those who have paid the original holding deposit or those on the reserve list who have received an offer of a position. The Organisers reserve the right to refuse an entry without giving a reason in accordance with NCR 83. Track Experience: Competitors will be required to have suitable experience on a race track in order to compete – a minimum of 3 CAMS sanctioned supersprints (or equivalent) in the past 2 years. The organisers reserve the right to validate entrant experience and their decision to accept or reject any specific entry will be final. Registration: Current CAMS log book or State Registration / proof of ownership papers must be presented at scrutineering. Minimum Lap Time: CAMS regulations for the Mt Panorama Circuit stipulate a minimum lap time (fastest accepted) of no faster than 2:36 (2 minutes 36 seconds). Drivers who exceed (better) this time twice through the event - will be excluded for the balance of the weekend (no refund). Maximum Lap Time: CAMS regulations stipulate that the slowest car should be no more than 130% of the fastest nominated time. Therefore the maximum lap time that will allow you to compete is 3:22 (3 minutes 22 seconds). Again if you cannot meet this time you will be excluded (no refund). Temporary Shelter (option): Within the on-line booking (see link below) there is an option to secure a "Temporary Shelter" (tent). It is strongly recommended you consider taking this option (75% to 80% of entrants usually do). PCNSW passes this to you at cost - and while it appears expensive - a couple of hot days or even worse, rainy days - and you will surely appreciate this option. Fuel is ONLY available at the track through the authorised fuel provider (Race Fuels). PCNSW wishes to strongly support the provision of fuel at the track and the use of this provider by our competitors. Attached to this email will be a Fuel Order Form for you to use and make your own arrangements with Race Fuels for the fuel you need. (In the past PCNSW used to enforce your spend of $100 with Race Fuels through a "voucher" system. This is no longer available to us and Race Fuels would like you to make your arrangements directly with them). Bookings are not transferable - they must be made by the person who intends to participate at the event. If you are unable to attend, let us know and your place will be offered to the next person on the reserve list. In the event that you cannot attend the event + all registered reserves have been exhausted ... you will forfeit your entry fees. PCNSW will not & cannot be held accountable for your lack of attendance for any reason. We will do our best in relation to finding reserves - accordingly the earlier your advise PCNSW, the better are your chances of a possible refund – so if you book and then discover you cannot attend, contact us ASAP. Since this is a Porsche Marque event, only Porsche Sports Cars (make and model) may enter. Since this is a regularity event, it is not possible to share a car with another driver - all cars are on the track at the same time. You must read the Supplementary Regulations and any other associated documentation which will be emailed to you closer to the event.